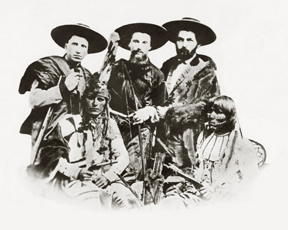 Members of pioneering Jewish families, Bernard Seligman, Zadoc Staab and Lehman Spiegelberg became freighters on the Santa Fe Trail. Married to a Jewish merchant in Deming, Ella Klauber Wormser took what may be some of the earliest photographs documenting the transition from cattle drives to rail transport in the early 1890s. In the second half of the 19th century, Jewish families began playing prominent roles in cattle ranching and sheep raising – roles that continue into 21st-century New Mexico. At 2 pm on Sunday, Oct. 27, the New Mexico History Museum joins with the New Mexico Jewish Historical Society and Temple Beth Shalom to present “Nice Jewish Cowboys and Cowgirls” in the History Museum auditorium. The event is free with admission; Sundays are free to NM residents. For “Nice Jewish Cowboys and Cowgirls,” Noel Pugach, professor emeritus of history at the University of New Mexico, will lead a panel discussion featuring members of the Gottlieb and Wertheim families, who will share their families’ stories and explain what “the cowboy way” means to them. Meredith Davidson, curator of 19th- and 20th-century Southwest collections, will present a selection of Wormser’s images also on view in Cowboys Real and Imagined. The event is part of a layered programming schedule for the exhibit that explores the diverse cultural backgrounds and heritage of New Mexico’s cowboys and ranching traditions. Through March 16, 2014, in the museum’s Herzstein Gallery, Cowboys Real and Imagined explores New Mexico’s cowboy legacy from its origin in the Spanish vaquero tradition through itinerant hired hands, outlaws, rodeo stars, cowboy singers, Tom Mix movies and more. Guest curated by B. Byron Price, director of the Charles M. Russell Center for the Study of Art of the American West at the University of Oklahoma, the exhibit grounds cowboy history in New Mexico through rare photographs, cowboy gear, movies and original works of art. It includes a bounty of artifacts including boots and spurs, ropes, movie posters, and the chuck wagon once used by cowboys on New Mexico’s legendary Bell Ranch. Photo: Freighters on the Santa Fe Trail, Bernard Seligman, Zadoc Staab, Lehman Spiegelberg and Kiowa Indian scouts. Palace of the Governors Photo Archives 007890.